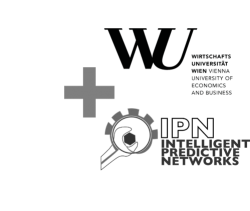 For Philip Vodopiutz as a successful alumni of the Vienna University of Economics and Business (WU – Wien) it is a special pleasure to announce the cooperation between the WU – Wien and IPN. The department ‘for Informations Systems and Operations’ of the WU – Wien is about to start a new specialisation (SBWL) in the field of data science. In order to provide the students not only with a profound scientific toolset but to offer them insights into real life applications the WU – Wien and IPN start to cooperate. On the one hand IPN will be a so called data provider and on the other hand IPN will offer workshops for the students giving them deep insights of how to use the scientific toolset on real life production data. Furthermore, IPN will provide the opportunity to write the master thesis or dissertation on topics that both fit the student and IPN. To us this cooperation means more than ‘yet another expansion of our network’ and access to highly educated resources. It means an opportunity to introduce the students to real life data science and to say thank you for the education Philip Vodopiutz received from the WU – Wien as a student. We just cannot wait for the summer semester of 2017 to begin. IPN was invited by the ‘österreichischen Forschungsförderungsgesellschaft (FFG)’ and the ministry of transport, innovations and technology (BMVIT) as one of three high-tech start-ups to attend the technology talks at the Forum Alpbach in Tyrol. The goal of these technology talks is to survey Austria as an industrial site as well as to discuss the main prevailing industrial challenges and innovations of the next years. According to this, the list of attendees was filled with the top-class personalities such as the CEOs of companies like AVL List, Rosenbauer, AT&S, voestalpine and many more. For us an ambitious young company the participation in an event like this is a huge opportunity to present our developments and our concerns to a top-class auditorium. One of the main elements of the technology talks was the presentation of the cooperation between the three start-ups and three of the top-class companies attending the talks. We from IPN presented our cooperation with AVL List which aims at analysing the capabilities of our intelligent system for predictive maintenance in the fields of large bore engines (cargo ships, power plants) and engine test beds. Professor Helmut List (CEO of AVL List) presented his impressions of the cooperation. At this point we want to thank Professor Helmut List for the positive words and the good cooperation between the companies until today. These positive words and the perspective for a long term cooperation are a huge compliment for us. Following the technology talks we used the opportunity to get in contact with the industrial decision makers leading to interesting talks. We could arouse the interest to possible collaborations for example in the field of vehicle monitoring as well as the field of production optimisation. Furthermore, we are looking forward to a long lasting and good collaboration with AVL List. We want to thank all the attendees and the host, Pioneers.io for the scouting as well as the president of the parliament mrs. Doris Bures for this great opportunity. In order to provide our customers with an all-in-one solution for intelligent maintenance prediction, planning and management, IPN and GreenGate entered into a cooperation. GreenGate is specialised on the development and implementation of a maintenance planning and management software (planning, document management, etc. ), hence it is a perfect match for the predictive and analytics products of IPN. The partnership between GreenGate and IPN enables us to offer a continuously integrated and intelligent maintenance system as a single solution. This solution offers you the functionality to perform tasks ranging from the configuration- and document Management over the prediction of maintenance tasks to the actual maintenance and production planning in one comprehensive tool. Initially, machines and components are configured as objects in the GreenGate software. This allows managing the manufacturing landscape and its components in an easy manner. After the initial mapping, all the objects including their meta-data (lead times, age, reference times, etc.) are automatically imported into the IPN analytics/predictive system in order to perform the predictions as well as different analysis and reporting. The result is automatically sent back to the GreenGate system which is calculating the optimal maintenance schedule and informs the person in charge. All of this happens in the background and fully automated. Therefore, your company is fully utilize the strategic power of maintenance without any extra resources. After attending the Maintenance 2014 in Hamburg and the Hannover trade fair we are about to leave for the Maintain 2014 in Munich. One of the core topics of this fair is ‘manufacturer services in the context of industry 4.0’. Therefore, our presentation titled ‘how statistical methods help to optimize your maintenance’ is one of the highlights of this trade fair. Grasp the opportunity to attend our presentation at the Maintain 2014 in Munich on the 03.06.2014 from 14:00 – 14:30. With the Hannover trade fair being held from the 7th to the 11th of April, the second week of April was as busy for IPN as the first week. We attended the fair in order to keep up to date with the latest developments in factory automation and industry 4.0. Furthermore, we wanted to get in touch with the big players in the fields of factory automation and software development for the industry. It is more than true to say that this trade fair emanates a flair of pioneering spirit. Most of the exhibitors presented interesting and futuristic concepts of how to link factories, machines and components to each other. SIEMENS for example presented “Titan” a humanoid robot straight from the future that introduced the visitors to the idea of industry 4.0. FESTO on the other hand presented a robot-kangaroo to demonstrate the advantages of bionic components in the automation world. We used the trade fair to establish important contacts. We have established research related contacts with companies like SIEMENS and WAGO and we started talks about possible cooperative projects with big players like FESTO, SIEMENS and ABB. These companies have shown a strong interest in our products and actively pushed the idea of a cooperation. Stay tuned as there are interesting news to come in the future! Just as in Hamburg at the Maintenance 2014 we have seen a strong demand for predictive maintenance systems both from the user’s and the manufacturer’s side. Furthermore, we could proof that our head start in research and development pays off as most of the companies presenting their predictive maintenance solutions are at the very beginning of their product development. We attended the Maintenance 2014 in Hamburg in order to strengthen our network and to keep up-to-date with recent trends in the fields of industrial maintenance and production technologies. We established contact and first ties with companies such as Cooper Standard, GreenGate and SKF. Furthermore, we attended expert sessions held by users and manufacturers about topics such as “industry 4.0” (German Version only) and “predictive maintenance”. For us the most important insight of the Maintenance 2014 is “everyone wants to but no one knows how to”. This sounds quite harsh but it shows the strong demand for innovations in industrial maintenance. In our opinion we are looking forward to an exciting future in industrial maintenance. It was especially noticeable that the core technology of all the products presented for predictive maintenance still is vibration analysis. This technique is based on predetermined fault and imbalance frequencies for specific machines. Eventually this leads to an inflexibility regarding the product’s applicability to other machines and fault factors. Furthermore, it is remarkable that the demand for predictive maintenance systems is strongly increasing but the well-established suppliers still have no satisfying answer at hand.